Lewis Hamilton made life difficult for himself off the line, and the slow start actually compromised several races. From there, we were in for a treat, as it was overtaking all round with drivers trying to recover from either poor qualifying sessions or a tough start to the race. The Mercedes duo managed to avoid crashing into each other, despite some on track tussling. If you missed any of the action, or want a lap by lap recap of what occurred, then the Factbyte Factbox can guide you through every pit stop, every retirement and every passing move. 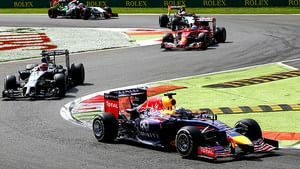 Hello fellow F1 fiends, this is the Factbyte Factbox for the Italian Grand Prix, we're just half an hour away from lights out. Are you with me? The pit lane has opened and the engines are firing up as drivers make their way to the grid, or for a couple of installation laps beforehand. We've got Mercedes on pole position, as per usual, and Williams close behind. The Mercedes power unit is dominating here at Monza, as the high speed nature of the circuit favours the best engines. 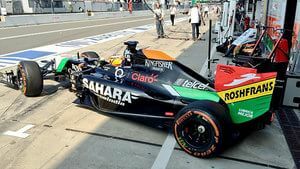 It's reckoned that one stop strategies will be the norm, meaning there may not be a lot that can be won or lost in the pit stops and strategy choices. The full starting grid for today's race can be found here but the top ten make for an interesting read. It's very much team by team around Monza, except for the Ferrari team. Alonso managed to get into the top ten, although couldn't make much impact on the Mercedes engines. Kimi Räikkönen struggled to put a clean lap together in Q2 and missed out on the final session. He starts 11th. Daniil Kvyat had originally qualified in 11th place but the Russian has become the first driver of presumably many this season to take a power unit penalty, after Toro Rosso put in his sixth engine of the season on Friday night. Both Bottas and Massa will be in a good mood after Williams announced they will continue with their driver lineup for next season. Confirmed seats can only be motivating for a driver! There's no doubt that all the attention is on the front row of the grid. Lewis Hamilton scooped pole position, but the Mercedes pair will arrive at that first chicane together. They've been told that racing is still allowed but crashing into each other is best avoided. There's 29 points between Hamilton and championship leader Rosberg, so a race win here could be crucial, for either! It's nice and sunny over Monza at the moment, and there's no rain expected for the afternoon. A dry race on the cards. Force India head to the grid. Sergio Pérez did well to get into the top ten, but could only end up securing the 10th place grid slot. Nico Hülkenberg lines up 13th. 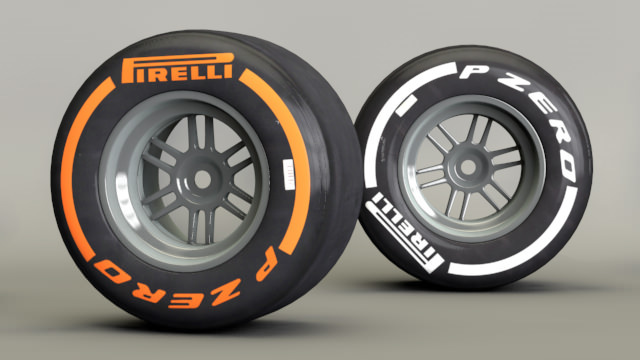 Hard and medium compounds are on offer for the drivers today, the orange sidewalls on the harder of the two tyres. These are the two hardest compounds available too. Paddy Lowe confirms that they've changed the nose on Hamilton's car on the grid, after it picked up a bit of damage - possibly from an engineer clouting it with some equipment. Ron Dennis, meandering calmly on the grid: "We’re not as strong as the Mercedes, Williams are strong but I think we’ve got the measure of the others. Hopefully we’ll get the strategy right. It’s going to be a challenging race for everybody. To finish first, first you’ve got to finish. The guys in front of us are probably going to be quite aggressive with each other, who knows what will come out of that." Marcus Ericsson will be starting from the pit lane, as the Caterham driver apparently was caught not slowing down under double waved yellow flags during final practice. He was last on the grid anyway, so it's probably not a huge loss for him. All of the top twelve are on medium tyres, the softer of the two options. Nico Hülkenberg, the two Saubers, Romain Grosjean, Daniil Kvyat and Marcus Ericsson are all starting on the hard, orange sidewalled, tyres. The mechanics whip off the tyre blankets and clear the grid at the very last minute, leaving the drivers to rev their engines and prep for the formation lap. Lewis Hamilton is slow away on the formation lap, Nico Rosberg scampers ahead but they're back in the correct order by the time they get to the first corner. Lots of Ferrari flags in the crowd, and even some red flare smoke drifting across the track, as the fans get ready for their event to start. Hamilton slows, and backs up the pack as he reaches the grid once again. The front runners line up neatly, as the rest of the field fall in behind. Hamilton has had an absolutely terrible start, bogged down off the line and dropping down to fourth place. It's a clean first corner, and somehow Magnussen has moved up to second place. Massa is third, and Valtteri Bottas is... all the way down in tenth. Vettel has moved up to fifth, whilst Ricciardo has gone in the wrong direction, he's got pushed back down to 13th. Rosberg is already pulling out a lead, with a visible gap over the McLaren in second place. Hamilton, on the radio, reports something isn't working correctly. Only his words had to be beeped out. The team instruct him to choose a different mode. Looking back at the start, Gutiérrez and Ricciardo missed the apex of that first chicane, which didn't help them retain positions! Further replays of the start show Bottas had absolutely no stability off the line, the rear of the car squirrelling around as he tried to get some pace. The following cars surged past him as he finally got things under control. Felipe Massa is told that the DRS is up and running and he can attempt to use it on Kevin Magnussen for second place. He's not quite close enough yet though. Massa tries to go to the outside of Magnussen but locks up and has to stay behind. Hamilton has closed the gap to that battle and watches on as Massa sweeps past the McLaren. Lewis then follows straight past, moving up to third. Bottas is now trying to make amends for that poor start, and closes up behind Nico Hülkenberg. He pulls alongside and outdrags him down to the following chicane. 10th place for the Williams. Yellow flags as Max Chilton has ended up in the gravel trap. The cameras missed the start of the incident, but Chilton hit the kerbs and flew through the air, landing straight on into the barriers. Bit winded, but otherwise okay, and the marshals move in to recover the Marussia. Team radio to Nico Rosberg: "Other car reporting rear tyres going off. Just be aware." Rosberg has gone straight on at the first chicane, weaving his way through the markers to rejoin in the lead. Bottas attempted a couple of moves on Kimi Räikkönen and has finally got the position, he's up to ninth place now. Hamilton, meanwhile, is still fighting to get past Williams. He draws alongside down the straight, and they are side by side through the second chicane, very clean racing and he gets ahead. Tweet from @clubforce: Checo is doing a really good job keeping with Alonso in a duel for P7 and P8. Just 0.7 between the two of them. There's something of a train going on, with Magnussen at the head of it. Vettel is following the McLaren, with Button, Alonso and Pérez behind. Bottas is gradually closing the gap to the Force India as well. There's just two seconds between Rosberg and Hamilton now. Nico must surely feel his teammate breathing down his neck! Replays show a really messy move between Grosjean and Bianchi, the Lotus driver diving forwards during the chicane, bouncing around off the Marussia, and eventually settling behind once more. Max Chilton, out on lap 6: "I just made a mistake, I was braking there on Friday on the heavy fuel, but probably just too late this early in the race. Hit two sleeping policeman which launched me. I’ve never had it like that before, when you’re airborne you can’t turn the car." Bottas has passed Sergio Pérez, moving up to 8th place. Fernando Alonso is the next car in his path. Three fastest laps in a row for Lewis Hamilton, the latest one 1:28.948 on lap 14. Team radio to Felipe Massa: "Okay Felipe, you're pressing the brakes when on throttle into turn five." Easy pass for Bottas to get ahead of Alonso down the home straight. He weaves his way around that first chicane and sets off after the next target - this time Jenson Button. Rosberg's front right tyre looks pretty worn, if the super slo-mo replays are anything to go by. When Hamilton gets within range, he may not have much left to defend with. Unseen by us, Esteban Gutiérrez has been into the pit lane taking on the medium tyre. That was back on lap ten, I reckon. Valtteri Bottas continues his charge, unstoppable past Jenson Button as he now moves up to sixth place. Vettel next in line. There's a bit of car flapping around on Grosjean's Lotus. Bit of bargeboard or something, wibbling around near the cockpit. They'll likely have to rip that off when he comes in for a pit stop. Sebastian Vettel comes in for his first pit stop of the afternoon - we were expecting the window to be about lap 20 so that's close enough. Force India double up on their pit stops, with Sergio Pérez coming in first and then Nico Hülkenberg following in. Good clean stops for both, it seems. Great work, pit crew. Kimi Räikkönen comes in for his first stop, we're definitely in the window now. Replays show that Kimi did exactly as Vettel did, locking up hugely into the pit entry. Bottas has also managed to get past Magnussen, he's up to fourth place now. There's some radio to Rosberg asking him to give feedback on his tyres via a switch. No audible response from the driver, but they must have got something as they continued talking. Secret radio messages now. What's next, morse code? Lots of pit stops now, Magnussen and Alonso from nearer the front, and Pastor Maldonado from towards the back. Tweet from @clubforce: Checo jumps Alonso after the first stop! What an excellent outlap by Sergio! Button has also come out behind Sergio Pérez, but manages to stay ahead of Alonso after their first stops. Felipe Massa comes in from third place. Vettel has also managed to improve via the pit stops, coming out ahead of Kevin Magnussen. Massa has rejoined in fifth place, the lead driver of those that have pitted so far. Nico Rosberg pits and Valtteri Bottas follows in quickly behind. Clean stop by Mercedes allowing Nico to filter back out in second place. Bottas rejoined alongside a lot of traffic and has ended up in ninth place. Lewis Hamilton has pitted from the lead of the race but Nico Rosberg sweeps past as the Mercedes pair retain their original positions. Ricciardo and Kvyat haven't pitted yet, sitting 3rd and 5th respectively. Bottas has got those tyres up to temperature very quickly, he's overtaken Sergio Pérez. Again. The Red Bull crew hustle into the pit lane, Ricciardo comes in for a nice 2.8 second stop. He managed to go eight laps longer than Vettel on those tyres. Team radio to Lewis Hamilton: "Okay Lewis, I reckon the race is going to be at the end. Suggestion is we sit two and a half seconds, get the benefit of tow without losing the downforce. We need the tyres at the end." Bottas has turned his laser sights on Magnussen, who in turn is not too far behind Vettel. Hamilton was closing in on Rosberg, and the pressure told on Nico who ran straight on at the first chicane again. Winding his way through the bollards allowed Lewis Hamilton to take the lead. Fernando Alonso's Ferrari is sitting off track and on the grass, the Spaniard climbs from the car in his first DNF of the year. Replays show Alonso just ran off track at the chicane, the car slowing to a halt safely out of the way. Power just disappearing beneath him. Hamilton has already managed to pull out the gap to almost three seconds on his teammate now, back in control of the race that he started in pole position for. Daniil Kvyat finally comes into the pit lane, such a long first stint for the Toro Rosso. Bottas was trying to chase down Magnussen but Vettel ahead was firmly in the way. Trying to avoid contact, Bottas got bumped over the sausage kerbs and lost time in doing so. Sergio Pérez takes on Jenson Button through the chicane, and some good clean racing later sees the Force India come out in front. 7th place for Sergio now. Bottas working on improving this stat though. Incident involving Kevin Magnussen and V Bottas under investigation - forcing another driver off the track. Replays show Magnussen definitely didn't leave Bottas a car's width as they were scrapping for position, but was the Williams far enough ahead to warrant it? The stewards will decide! 5 second stop/go penalty for Kevin Magnussen - forcing another driver off the track. Bottas had already dispatched Magnussen on track, moving up to fifth place. Normally the five second penalty would be taken at the next pit stop, but presumably there's not going to be another stop here, so it will be added to his time at the end of the race. Hamilton has the gap out front to just over four seconds, comfortably leading over his teammate. Jenson Button pulls alongside Sergio Pérez to make the move for 8th place, but the Force India comes back at him. They're still side by side as they go through chicane, and straight, and more corners. Pérez has regained the position, but the fight has allowed Ricciardo to close the gap to that battle. Bottas has overtaken Sebastian Vettel for fourth place, amazing work from the Finn this afternoon. Daniel Ricciardo has made his way past Button, who was distracted by the previous battle with Pérez. Eighth place for the Red Bull driver now. Ricciardo closes up to Pérez, attempts a move round the chicane but can't do it at first, eventually muscles his way past for seventh place. Now Button senses an opportunity to move past Pérez, and he makes it stick. Sergio has another look down the following straight but the McLaren is later on the brakes. Button has a terrible exit though and Pérez gets back ahead. A couple of mistakes through the chicanes for Button there, that allowed the Force India to take back the position. Potentially better speed on the McLaren but better racecraft from Pérez. Ricciardo picks his way past Magnussen, locking up as he does so but still managing to keep the position. He's now in 6th place behind teammate Vettel. Daniil Kvyat pulls alongside the Force India of Nico Hülkenberg. Nico has the stronger power unit here, as they make their way past a backmarker. Kvyat has to back off but remains in the hunt. Fernando Alonso, retired on lap 29: "It was an ERS failure, that automatically switches off the car as it can blow up the normal engines. Unfortunately that happened here in front of our people but we need to recover. Unfortunately, these things happen, not very often and I’m lucky to have a lot of races seeing the chequered flag but when it happens, it’s a little bit strange. Nothing we can do now just think of the next one." Kvyat has better grip and uses the slipstream to easily take the position from Hülkenberg, he's moved up to 11th place now. Teammates are battling on track, but it's not who you think. Ricciardo makes a late braking move on Vettel and takes the place, up to fifth place. A good replay of that move: Ricciardo was behind but pulled alongside into the first chicane. He had to back off into that one, but on the following straight dummied right and then pulled to the left to take the position. Vettel was the first driver to make his one pit stop, and his tyres must be struggling now. He's at the head of a train with Magnussen, Pérez and Button within two seconds of him. Hamilton still has a four second gap over Nico Rosberg, but replays show a huge lock up for the race leader which won't help his tyres. Just four laps to go now, though. 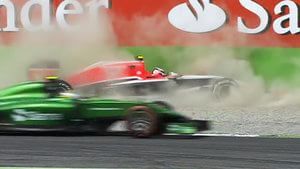 Replays show a small collision between Esteban Gutiérrez and Romain Grosjean. Esteban made a poor attempt to pass, ending up puncturing his own tyre on Grosjean's front wing. The Sauber driver has made his way back to the pit lane. Incident involving Esteban Gutiérrez and Romain Grosjean will be investigated after the race - causing a collision. Daniil Kvyat misses the chicane, running at high speed down the side - misses the bollards, stays on the grass and somehow keeps control. He's back on track but slow now. Looks like some kind of brake failure as he just didn't slow down into the chicane at all. Rosberg follows along for second place, with Felipe Massa taking his first podium position of the season. Team radio from Nico Rosberg: "Good job guys, a deserved one two. A great result for the team. I'm sorry for my side of the garage. A real shame." Magnussen finished seventh but with the additional five seconds to be added to his time, he ends up tenth. Tweet from @WilliamsRacing: Awesome job for Felipe! His first podium for Williams with Valtteri P4!! Good afternoon for us!! The track invasion includes a giant Ferrari flag being brought along by the flags. Not much to celebrate with a net ninth place and DNF. 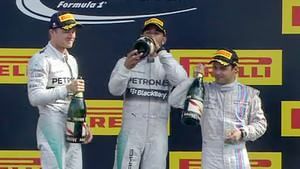 The top three make their way to the podium, there was no conversation between the Mercedes two in the green room, with Hamilton focusing all his attention on Massa. The national anthem plays out, with the crowd below the podium cheering and waving their flags in time with the music. Still some boos from the crowd as Rosberg gets his trophy and raises it above his head. Lots of love for Felipe Massa though, former Ferrari driver that he is. Great overhead shots of the huge track invasion - champagne, flags, confetti, it's all so beautiful. The podium interviews involve Rosberg and Massa showing off with their Italian skills. So, no transcript from me, I'm afraid. That was a far more entertaining race than I thought it was going to be, plenty of overtaking - much of it coming from Valtteri Bottas! Strong race for Williams, helping them move back in front of Ferrari in the championship. Strong race for Mercedes too, mostly for getting to the end without crashing. Disappointing result for Daniil Kvyat who had been looking so strong through qualifying and in the race itself. Impressive skills to hold that car while it was struggling to go out of control, and finish the race in 11th overall. Driver of the day has to be a toss up between Bottas and Ricciardo, both of whom showed some exemplary overtaking skills at various points. Look out for the vote later! That's all for this Italian GP coverage, then. As always, stay tuned to Sidepodcast for news and views and more whilst you wait for the Singapore race in two week's time. I'll be back here then, and I hope you will too!